We are pleased to be showing Colorado artist, Cynthia Feustel, in her show “Be Still” during the month of February. Be sure to join us for First Friday, February 1, 5-9 pm. Colorado artist, Cynthia Feustel helps usher in 2013 with her exhibit of figures and still life. 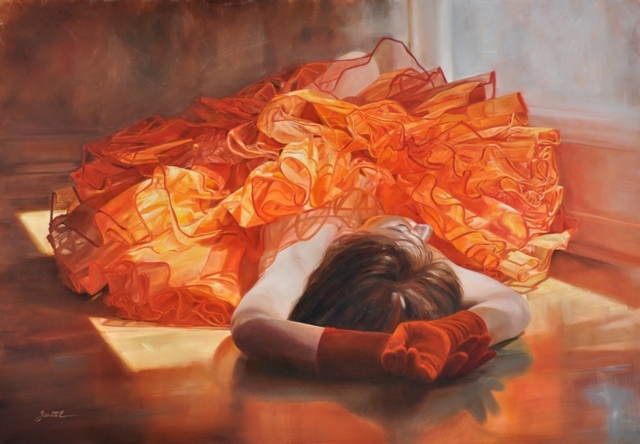 Feustel refers to her style as contemporary realism and will show an amazing body of work that includes a variety of stunning portraits and still life pieces. 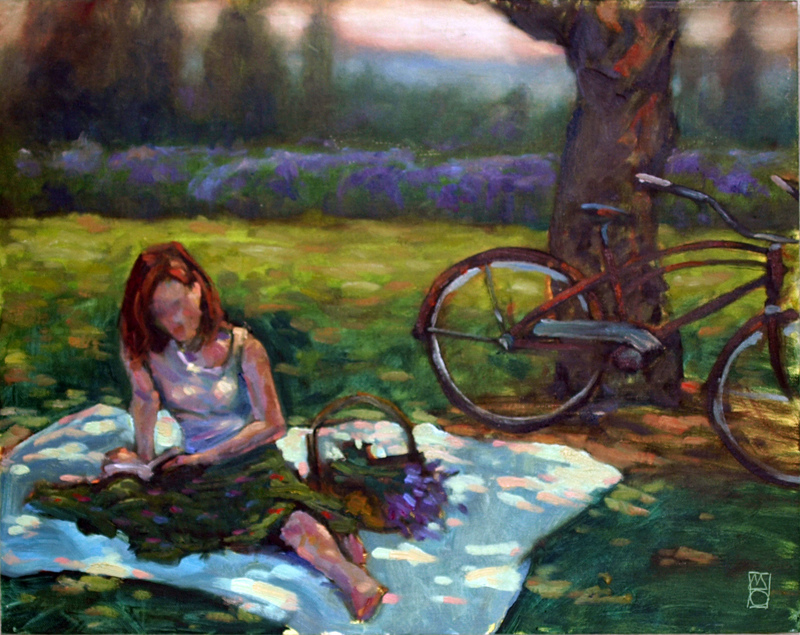 The image shown here is “Summer Solstice”. Most recently Cynthia was featured in the December issue of Southwest Art Magazine for her Honorable Mention award for her entry in Artistic Excellence 2012 . 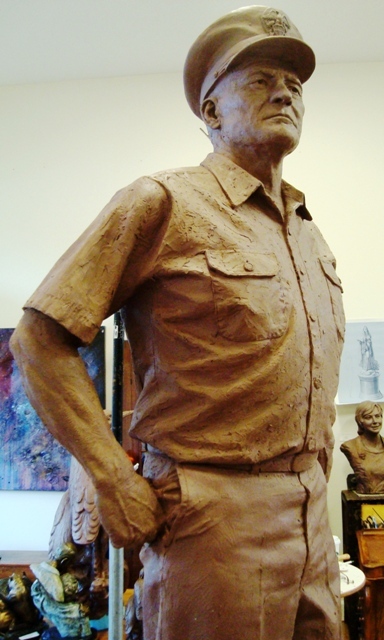 Rip’s sculpture of Fleet Admiral Chester Nimitz is in progress and on display. Take advantage of this great opportunity to see history in the making–literally. The monument is set to be dedicated in August 2013 at the Pearl Harbor Memorial in Hawaii. It’s not too early to think about Valentine’s Day. Ali Peret can help you select the perfect piece of jewelry. Remember, February’s birthstone is amethyst so keep that in mind when shopping for your special Valentine. If you love artisan jewelry, Katie Hovis of Whimsy will be here with her gorgeous new rings. Very cute and affordable! Katie uses fine metals and gemstones for her unique wire wrapped jewelry. As always, we will have entertainment and wine tasting. Local songwriter and vocalist, Crystal Lariza will sing and our friends from Phelps Creek Vineyard will offer FREE wine tasting. Make sure to start your weekend off with us! Festivities start at 5 PM and most Troutdale merchants participate. Troutdale has great shops, restaurants, and plenty of parking. We still have several pre-cast opportunities, so ask us about them when you’re in the Gallery. 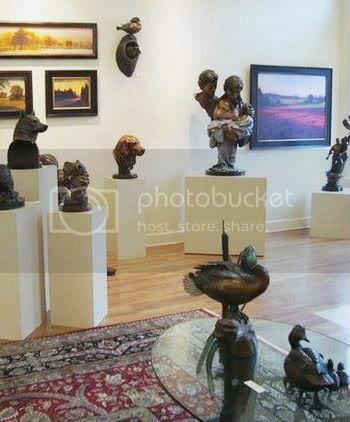 Remember, Caswell Gallery offers a simple layaway plan! 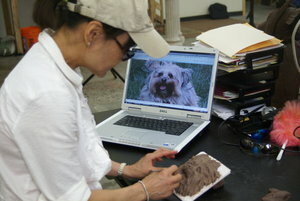 Rip is also offering a Sculpture 101 class starting February 4. The class will meet twice a week for three weeks from 6:30-8:30. This will be a unique opportunity for aspiring sculptors to learn about sculpting and lost wax casting with acclaimed sculptor Rip Caswell. You will begin working in Rip’s Studio at Caswell Gallery in Troutdale. Using your own design, Rip will guide you through the sculpting process and you’ll learn about the casting and patina process first hand when you finish your piece with Production Manager, Lonnie Paola at Firebird Bronze Foundry in Boring. When you take home your own miniature bronze sculpture, perhaps an heirloom, you might even be inspired to start your own artistic journey. For more information call us at 503-492-2473. Rip is bringing the “trout back to Troutdale”! This week Rip arranged for 100, 8-9 inch trout to be delivered to the pond on the future Caswell Gallery and Garden Apartments; gallery and artist living/work spaces. How did Troutdale get its name? Captain John Harlow, a former sea captain from Maine and successful Portland businessman, conceived a plan for the town of Troutdale. 1872 he purchased land to build his home and named his place Troutdale in reference to the fish ponds he built near the cliff. Around 1915, the Mayo family purchased land a stone’s throw south along the cliff and built apartments. Inspired by Harlow’s ponds, Mayo dug a series of ponds and raised his own trout. Caswell now owns this property and intends to develop his own apartments that will house artist, with live work spaces. You can still see the spring boxes on the hillside Mayo used to capture the water. Metal pipes fed into a series of concrete holding tanks to raise the fish until they were of size and released into 4 separate spring fed ponds. People were charged a fee to fish. The pond no longer has these separations and has become a favorite place for local wildlife. 12 nesting pairs of wood ducks, countless frogs and a few pond turtles have been observed and this winter a flock of 20-30 mallards. Red wing black birds use the cattails, two great blue herons, osprey, eagles and even a river otter all have been spotted. 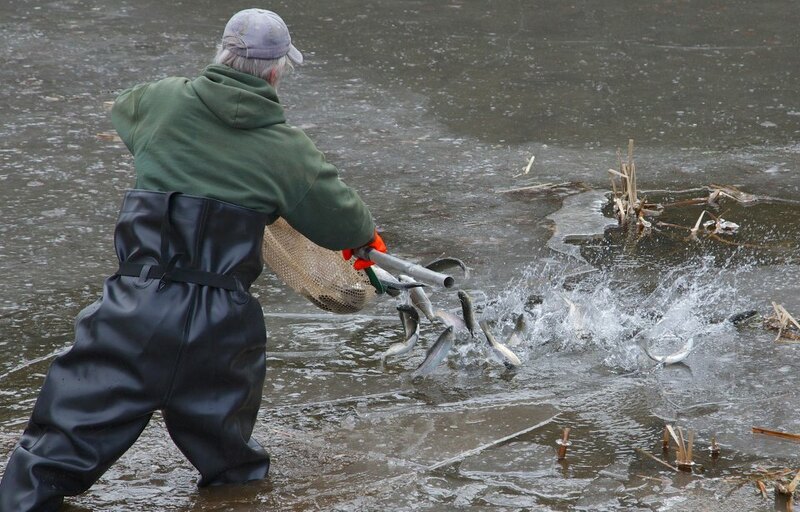 It is the hope that the trout will support these animals and sustain their habitat. Once the property is developed, the pond may be opened periodically to allow children to fish. A member of the Troutdale community for over 2 decades, Rip has been actively involved in development and enhancement of Troutdale as a tourist destination. Our group show is extended through the month of January. In the Gallery you will find beautiful work by pastel and oil painter, Brenda Boylan; oil painter, Michael Orwick; artisan jewelry designer; Katie Hovis; and fine jewelry designer, Ali Peret. Most of you know Brenda’s gorgeous, landscape pastel work, but she has been working in oils this year and is showing a body of work including city scapes. Also joining the group is oil painter, Michael Orwick whose beautiful landscapes of familiar Oregon locations are always popular. 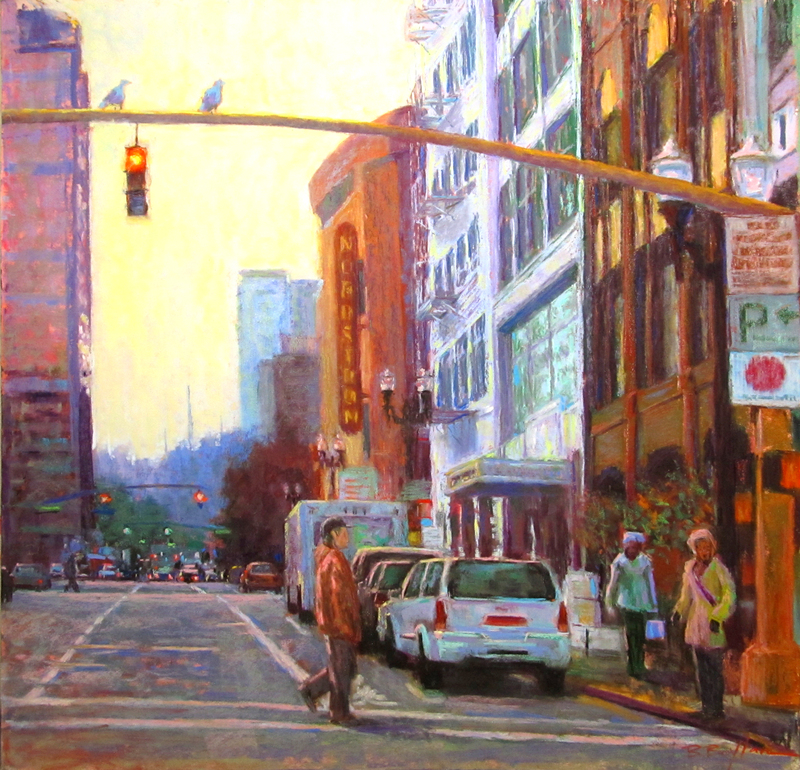 We now have several acrylic paintings by Phillip Smith. We have shown Phillip previously and are excited to have him back. Ask to see his amazing painting, Water and Light. Also in the Gallery, beautiful blown glass platters by Russell Ford and unique extruded crystal lamps by Keith Appleman. These glass pieces would be wonderful additions to your home decor. If you love Steven Thor Johannesson, we have some of his fantastic drawings, too. Visit Ali Peret Custom Designs and see what he has been working on. If you were engaged over Christmas or have a special occasion coming up, he is the man to see. If you love artisan jewelry, Katie Hovis of Whimsy designs unique and one-of-a kind bracelets and pendants, using fine metals and stones. She has a new line of rings–very cute, and affordable. Rip has several pre-cast opportunities. He has also started sculpting Fleet Admiral Nimitz, so definitely come by and take a look at this piece in progress. Lastly, there in no First Friday in January, but we will be back “in the swing” on February 1, 2013 when we will be showing Colorado artist, Cynthia Feustel. For a sneak peek, Cynthia was featured in the December issue of Southwest Magazine. Wishing you a New Year full of happiness, health and good fortune.